San Francisco, CA – J-POP SUMMIT 2017, one of the world’s biggest Japanese pop culture events, has announced additional dance and music artists set to perform at this year’s festival. This year’s event will be highlighted by an exciting 2-day slate of live music from a wide range of top Japanese pop, anison (anime song), dance, electronica, enka (Japanese soul) and rock artists that will complement an extensive roster of immersive experiences and attractions inspired by the wonders of Japanese pop culture. Just-added artists that are scheduled to perform include anison rock singer, May’n, world-renowned professional Kendama performers from Japan, Zoomadanke, the vogue-inspired dance performance group, TOKYO GEGEGAY, and the mother and daughter singing duo of Azumi Inoue & Yuyu; the widely renowned singer of theme songs to beloved anime films from the legendary Studio Ghibli, and her daughter Yuyu. The newly added artists complement other live performers previously announced that include BAND-MAID, Babyraids Japan, Misaki Iwasa (Former AKB48) and YANAKIKU. J-POP SUMMIT 2017 takes place on Saturday and Sunday, September 9th and 10th at the Fort Mason Center for Arts and Culture located in San Francisco’s Marina district. Attendees will experience the festival’s theme of ARTS, EATS and INNOVATIONS; a vibrant celebration of Japanese pop culture featuring live music, Japanese food and travel attractions, and interactive technologies. The festival is accented by ramen vendors, sake-tasting, and additional events highlighted by celebrity Guests of Honor. Festival details are available at www.J-POP.com. As one of the must-see Japanese female rock vocalists of a new generation, May’n has performed a wide array of music for anime. She drew initial acclaim as the singing voice of Diva of the Galaxy, Sheryl Nome, in the anime series, Macross Frontier. In 2014, she made a long-time dream come true by completing her biggest world tour ever consisting of 47 cities in Japan and multiple foreign countries, including her first-ever appearance at J-POP SUMMIT in San Francisco. More details available at: http://www.j-pop.com/guests/mayn. 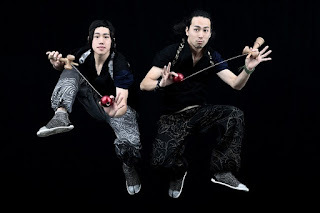 Zoomadanke is one of the most famous professional Kendama performers in Japan. The duo consists of Takeshi Kodama (Kodaman) and Hiroki Iijima (Easy). They are pioneers who blend the elements of Kendama, which is a traditional Japanese wooden toy, with dance and music to create a new style of live performance. Their stylish and acrobatic performances also have captured a growing international following. More details are available at: http://www.j-pop.com/guests/zoomadanke. TOKYO GEGEGAY is an eccentric art and dance performance group led by Munetaka Maki, aka MIKEY, along with four girls: housewife BOW, yoga instructor MARIE, University student MIKU, and the Colleen Bawn of the group, YUYU. TOKYO GEGEGAY recently won the 10th Japan Dance Forum Award. This award is given to an individual or a group with a remarkable year of creative activity and who has made a major contribution to dance scene in Japan. The group also has performed in the Philippines and Thailand. By crossing cultural borders, the troupe has leveraged the power of dance and has received extremely positive coverage from fans and the media. More details available at: http://www.j-pop.com/guests/tokyo-gegegay. Yuyu is the daughter of Azumi Inoue. In 2012 Yuyu made her debut at the age of seven on the public broadcasting channel NHK, performing the song “6 Sai No Ballad” (6 Year-Old’s Ballad) for the TV show, Minna No Uta, which has a 50-year history, was bombarded with requests for the song, making it a huge hit. In 2014, her song, “Hanbun Otona” (Half an adult), a duet performed with her mother Azumi Inoue, was also broadcast on NHK’s Minna No Uta, making it her third consecutive song to be shown on the program. She is currently a 12-year-old junior high school student. Visit www.J-POP.com for additional festival information and a comprehensive listing of all the J-POP SUMMIT 2017 attractions and events. J-POP SUMMIT is one of the world’s biggest Japanese pop culture events held annually in San Francisco, CA. As an open playground of discovery and diversion inspired by the wonders of Japanese pop culture, J-POP SUMMIT presents ARTS, EATS and INNOVATIONS; a vibrant celebration of Japanese pop culture featuring live music, Japanese food and travel attractions, and interactive technologies. With more than 20,000 attendees for two days, the festival has become an immersive landing platform for new trends from Japan. Jab Bhi Teri Yaad Aayegi ringtones download mp3 is the most popular music today, do you download the machine?